Plot. Income: 3. Initiative: 5. Claim: 1. Reserve: 6. Plot deck limit: 1. Forced Reaction: After the challenges phase begins, return each character with printed cost 3 or lower to its owner's hand. Card design by 2005 World Champion, John M. Bruno. RRG pg 8. For any given triggering condition, forced interrupts take priority and initiate before non-forced interrupts, and forced reactions take priority and initiate before non-forced reactions. 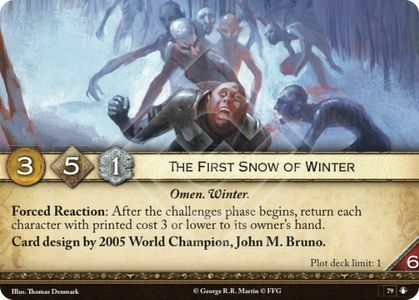 Therefore, First Snow takes priority over "normal" reactions to the beginning of the challenges phase, like Brothel Madame. So Brothel Madam will bounce to hand before she gets a chance to trigger.